Debra Moser holds a Master of Nursing and Doctor of Nursing Science from the University of California at Los Angeles. She came to UK from The Ohio State University College of Nursing, Department of Adult Health and Illness Nursing. Since 1997, she has served as co-editor of the Journal of Cardiovascular Nursing. 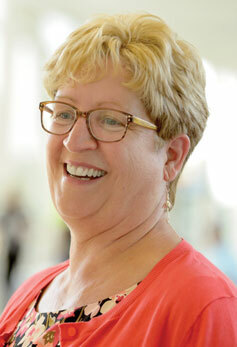 Dr. Moser's distinguished career began with 12 years of critical care nursing. This was just the beginning of a steady, productive journey toward her current program of research: working with and studying patients with coronary heart disease. As the College's Linda C. Gill Chair in Nursing and co-director of the RICH Heart Program, Moser is researching ways to improve outcomes and quality of life in people with heart failure and other cardiac conditions. Dr. Moser directs the Center for Biobehavioral Research in Self-Management of Cardiopulmonary Disease at the College of Nursing. She is currently involved with six different NIH-funded research projects, including three collaborative efforts with investigators from other institutions. Her work has been published in numerous journals, including the Journal of the American College of Cardiology, Circulation, Nursing Research, Social Science and Medicine, the American Heart Journal, the American Journal of Cardiology, and the American Journal of Emergency Medicine. Dr. Moser has earned numerous honors and awards, the most recent being the 2010 Nurse Practitioner Advocate State Award for Excellence from the American Association of Nurse Practitioners. Also in 2010, she was a Distinguished Visiting Scholar at the Massachusetts General Hospital in Boston. In 2009 she was awarded a lifetime membership in the American Association of Heart Failure Nurses; she was a finalist for the Provost's Outstanding Teaching Award at the University of Kentucky; and the UCLA School of Nursing named her one of "60 Alumni Who Have Made a Difference." In 2008 she received a Volunteer Recognition Award from the American Heart Association, Research Administration. She was named 2007 Distinguished Research Lecturer by the American Association of Critical-Care Nurses. In recognition of her contributions and achievements in the field of cardiovascular nursing research, she received the 2006 Katharine A. Lembright Award from the American Heart Association Council on Cardiovascular Nursing. In 2004 she received the Excellence in Research award from the American Association of Critical-Care Nurses. In 2002, Dr. Moser was the recipient of the award for Research Article of the Year from the American Heart Association, Council on Cardiovascular Nursing. In 2003 she was selected to receive a Fulbright Senior Scholar Award. In connection with this award, she spent four months in 2004 in Sydney, Australia at the University of Western Sydney, the University of Newcastle, University of Technology, St. George Hospital and Royal North Shore Hospital, doing lectures and collaborative research on patient delay in seeking treatment for acute myocardial infarction symptoms, and also on heart failure.